The purpose of her call was always the same: to hustle up some copy for an upcoming issue. Has anyone here ever said “no” to Phyllis? Not that I’m complaining: Phyllis provided the nudge and New Politics the venue that kept me writing. But I’m trying to convey how she ran the journal through the force of her personality. Hellman said that ‘radicals’ like herself had done no harm. She was mistaken. By promoting a totalitarian movement in the name of socialism she and they had done enormous harm. They had impeded the development of an authentic socialist movement by distorting the basic concepts of socialism, promulgating the idea that a society based on the destruction of working class independence, on terror and the liquidation of millions was socialist. They not only distorted history but made a mockery of the American radical tradition. Vintage Phyllis and our credo at New Politics. It is impossible to talk about Phyllis without talking about Julie. Their love for each other seemed to fulfill all of the bourgeois nostrums concerning marital fidelity and devotion. Except that this was the real thing. Their love sprung from deep friendship and genuine devotion and was born and lived through their shared politics. Nor was it a politics defined by any political orthodoxy. 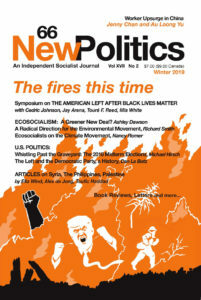 Their politics were developed in their youthful struggles as workers and as self-made intellectuals, and much later as the founding editors of New Politics, where they labored side by side, single-handedly attending to the myriad details, from reviewing and editing manuscripts to the production and distribution of the journal. Did you ever see such a labor of love? And what a formula they had for fusing politics and life: they would pour themselves into the next issue, send it off to the printer, and then take off—traveling to remote corners of France, Italy, or Spain, visiting chapels that housed some obscure fresco, laying over at historic hostels in the countryside, and of course, eating well wherever they went. What a couple they were: Phyllis and Julie. After Phyllis was struck down, did you ever see such a display of total devotion, as Julie moved the journal to her room in the nursing home? I remember that he would tell Phyllis about what was going on with the journal, sharing their private jokes, certain that she took in everything that he said. He simply would not go on without her collaboration and consent. Their legacy to us was New Politics, and the best thing we can do in remembrance and in love for Phyllis and Julie is to keep New Politics afloat. And to take their example to heart, and in-between issues, relish life and family and good food and wine. The last meal I had with them, just before they left on that fateful trip, was at their home with Herbert Hill. Or “Herbie,” as they insisted on calling him (after all, Herbie had been a playmate of Phyllis’s as toddlers in the Bronx). Truth be told, they both seemed frail and Herbert and I urged them to cancel their trip. But just as Phyllis and Julie remained steadfast in their politics, they stubbornly clung to their youth and their spirit of adventure and joy of living, and were not cut out to make concessions to age (any more than Howard Zinn and Noam Chomsky and other political stalwarts of that generation). Well, Phyllis and Julie are gone now, as is Herbert Hill. But we can take a measure of solace in knowing that Volume XIII, No. 1, of the second series, is now in press.